A team of four students from RIT’s Saunders College of Business earned first place in Macy’s Marketing Challenge 2016. 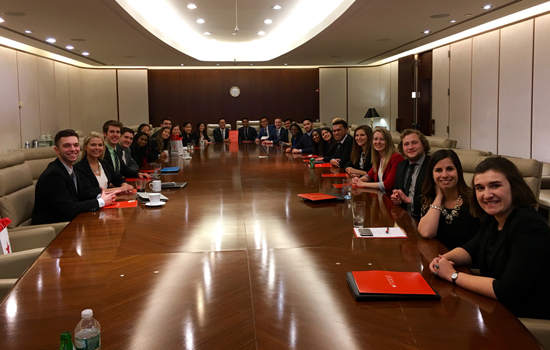 Celebrating in New York City with executives and students from five other participating universities were from left: Nicholas Commisso, Jacqueline Collelo, Brandon Rall and Christian Vanderhoef. Four Saunders College of Business students at Rochester Institute of Technology created new marketing strategies to attract new millennial customers to Macy’s department stores. The team earned first place for RIT in Macy’s Undergraduate Marketing Challenge 2016—winning iPads and an all-expense-paid trip to New York City in mid-April to present their ideas to company executives. The participants are all second-year students from Saunders College: Nicholas Commisso, management information systems from Syracuse, N.Y.; Jacqueline Collelo, new media marketing from Buffalo, N.Y.; Brandon Rall, marketing and international business from Findlay, Ohio; and Christian Vanderhoef, management information systems from Farmington, N.Y.
RIT was one of six participating schools including University of California-Berkeley, University of Pennsylvania, University of Wisconsin-Madison, University of Arizona and George Washington University.